Amirali Ghasemi ; Choose Your Background from Akskhaneh on Vimeo. Amirali Ghasemi’s Choose Your Background (2006-12) is a movable feast of site-specific tourist photography. This interactive series involves the visitor’s choice of one of the artist’s hand-painted back-drops, which depict iconic international tourist monuments, used as a stage for personalized tourist photographs. The backdrops are like those found in historic portrait studios, or in the urban streets of South Asia, as used by itinerant photographers. The backdrops are painted by Ghasemi himself in grisaille, an ironic reversal of the historic practice of using colour backdrops that were transformed into black and white or sepia photographs. 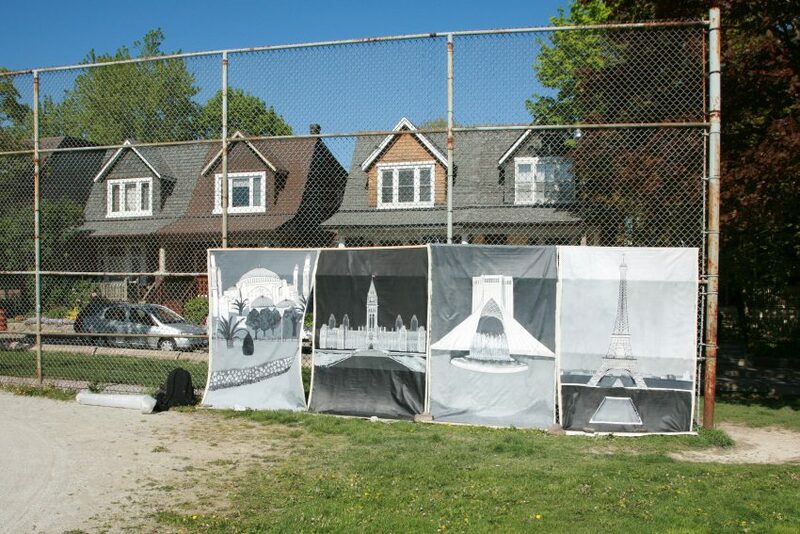 The monuments include the Eiffel Tower, Taj Mahal, Brandenburg Gate, Hagia Sophia, Azadi Tower, and now, as a result of a SAW Gallery commission, Ottawa’s Parliament Buildings. The backdrops reference many of the key cities (in particular, Paris, Berlin, Tehran, and Istanbul) to which contemporary art pilgrims travel within a vibrant, global economy of cultural tourists with nomadic or trans-national identities. Volunteers pose spontaneously before Ghasemi’s camera, but the humorous encounters — between portrait subject, artist, city, and monument — are memorialized as keepsakes. They constitute a shifting, cross-cultural community of artists, actors, writers, musicians, and other talents. Most who pose are photographic artists, and thus the resulting Choose Your Background portraits can be viewed as send-ups of the contemporary art paradigm of performative (staged) photography that emblematizes ciphers of identity and agency. Subverting the art market’s commercialization, Ghasemi gives the portrait volunteers their digital images free of charge and suggests that they also are circulated widely on the Internet. Andrea Fitzpatrick is an associate professor in the Department of Visual Arts at the University of Ottawa, where her research focuses on contemporary lens-based art, cultural theories, and media images. Issues of gender, identity, and the body are key areas of interest.